In the wake of the National Commission of Audit and a bleak Federal Budget for public services, CPD releases the compiled and updated False economies series, including the new final instalment Good, better, best (plus an excellent foreword by Terry Moran AC and original cartoons by Fiona Katauskas). Early instalments in the series have clarified the full meaning of ‘efficiency’, highlighted examples of the effects of cuts applied as a result of the term’s misuse, and revealed that the Australian Public Service (APS) is highly efficient – ranking second behind Switzerland among OECD countries. Updated editions of these instalments are included in the full compilation. 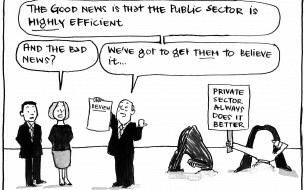 Overall, the False economies series concludes that the way we discuss public service efficiency is damaging the country. The term’s misuse justifies policy approaches that can actually drive inefficiency and waste, and distracts us from good ideas for genuine efficiency improvements. New material draws on interviews with public sector experts to identify innovation and professional accountability as two keys to greater efficiency. Good, better, best finds that the National Commission of Audit and Federal Budget adopted a narrow approach to questions of efficiency. 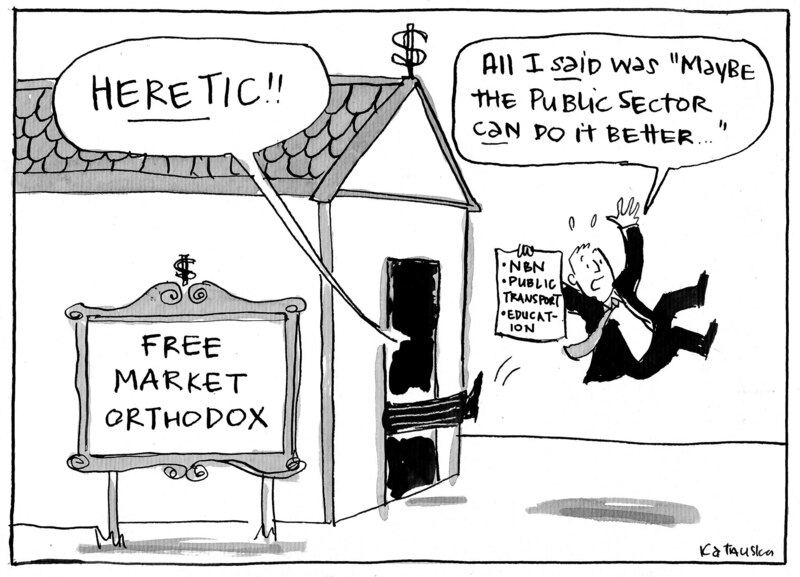 In striving for ‘smaller and more rational government’, the value delivered by some affected agencies is largely overlooked to deliver ‘leaner business-like ways of operating’. An Efficiency Dividend of 2.5% will compound this, resulting in across-the-board cuts to services ‘regardless of their utility’. The upshot is that the Federal Government is withdrawing from (or reducing) a range of services, threatening the overall efficiency and effectiveness of the Australian Public Service at a time of increasing uncertainty. The current budget estimates the loss of 16,500 public service jobs in the next two years – a similar scale of cuts to those of the early Howard Government, which were followed by rapid staff increases within a few years. Such fluctuations threaten allocative and dynamic efficiency, stripping out skills and eroding competencies in key areas. Public sector innovation faces different constraints to those in the private sector, often operating in a risk-averse environment with a lack of investment. The report recommends cost-effective measures to support innovation, including cross-agency innovation teams, incentive schemes and a dedicated innovation fund. Public service goals are more complex than the private sector profit drive, and this special context requires an emphasis on professional accountability. The report recommends the APS should: focus on organisational outcomes, with clearly defined priorities informed by a national planning process; improve accountability by closer engagement with service users and front-line public servants; reinforce efforts to increase trust between management and staff; and work for more constructive relationships between ministers and public servants. Chris Stone said: These are complicated areas for reform, but could generate real improvement to the services that will be vital to all Australians in a time of growing complexity and uncertainty. Note: The updated content of False economies: Doing less with less has been split into a series of boxed inserts included in chapters 1 and 2. The updated contents of the other reports appear in the chapter of the same name.